For superior insulation and energy savings, we recommend steel/fiberglass doors and vinyl window frames. Many projects involve replacing old drafty windows and doors with energy efficient, maintenance-free models. 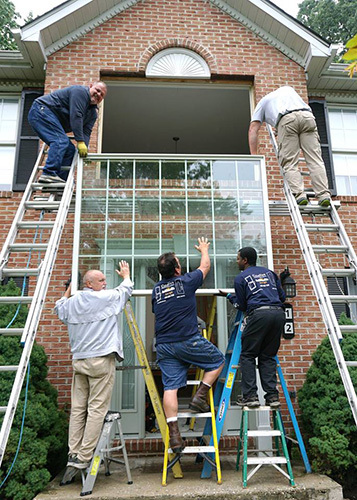 The image below shows us replacing the large picture window above the entrance door and the entrance door in Cockeysville, Maryland, Baltimore County. For the most energy efficient windows in Baltimore County, you can’t go wrong with Clearview windows. These windows are made from premium components. Some of the cities and towns we serve throughout Baltimore County include: Arbutus, Arcadia, Baldwin, Baltimore Highlands, Boring, Bowleys Quarters, Bradshaw, Brooklandville, Butler, Carney, Carroll Crest, Catonsville, Chase, Fork, Cockeysville, Dundalk, Edgemere, Essex, Fort Howard, Franklinville, Freeland, Fullerton, Garrison, Germantown, Glen Arm, Glencoe, Glyndon, Granite, Gwynn Oak, Halethorpe, Hampton, Hebbville, Hereford, Hunt Valley, Hydes, Jacksonville, Jerusalem, Kingsville, Lake, Lansdowne, Loch Raven, Lochearn, Long Green, Lutherville-Timonium, Maryland Line, Mays Chapel, Middle River, Milford Mill, Monkton, North Point Village, Nottingham, Oella, Overlea, Owings Mills, Parkton, Parkville, Perry Hall, Pikesville, Phoenix, Glyndon, Rodgers Forge, Randallstown, Reisterstown, Rosedale, Rossville, Ruxton-Riderwood, Sparks, Sparrows Point, St. Denis, Stevenson, Timonium, Towson, Turners Station, Upper Falls, Upperco, Wetheredsville, White Hall, White Marsh, Woodlawn, Worthington.